September 4, 2017 - The Optical Society of America (OSA) announceed on August 18 that the Guide Star Alliance is the winner of the 2017 Paul F. Forman Team Engineering Excellence Award. 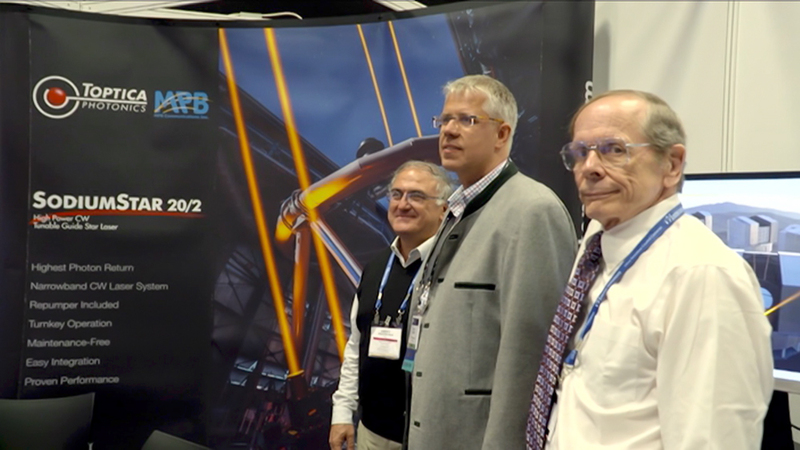 Under contract of and in close collaboration with the European Southern Observatory (ESO), industrial partners, TOPTICA Photonics and MPB Communications Inc. (MPBC), joined together to develop a high-power CW tunable laser system called the SodiumStar. The team’s development is now considered the quasi-standard for existing and planned telescopes around the world. After seven years of development, the SodiumStar is now recognized as a core technology for the next generation of earth-based telescopes. The sodium laser system creates an artificial guide star to remove image blurring due to the earth’s atmosphere, while providing efficient power conversion, wavelength stability, excellent beam quality and high photon return. The design of the SodiumStar is dynamic, allowing the possibility of scaling the output power to even higher levels while preserving excellent beam quality. Apart from basic astronomical research, this laser system will leverage ground-based approaches to space debris tracking and remediation using lasers as well as ground-to-satellite laser communications. The Guide Star Alliance will receive the award on 18 September 2017, during Frontiers in Optics (FiO) + Laser Science (LS) in Washington DC, USA. Dr. Wallace Clements and Daoping Wei of MPB Communications Inc., and Wilhelm Kaenders, TOPTICA, will accept the award on behalf of the team. The Paul F. Forman Team Engineering Excellence Award was established by The Optical Society in 1989 and has since been bestowed on dozens of outstanding researchers and engineers. Named in remembrance of Paul F. Forman, who, among many other accomplishments, effectively raised the visibility of optical engineering. This team award recognizes technical achievements such as product engineering, process, software and patent development, as well as contributions to society such as engineering education, publication and management, and furthering public appreciation of optical engineering. For more information on the award or the nomination process, visit OSA Awards.